Or load up the basket with fully lit briquettes for high-heat cooking (400+ F) perfect for chicken or pizza! 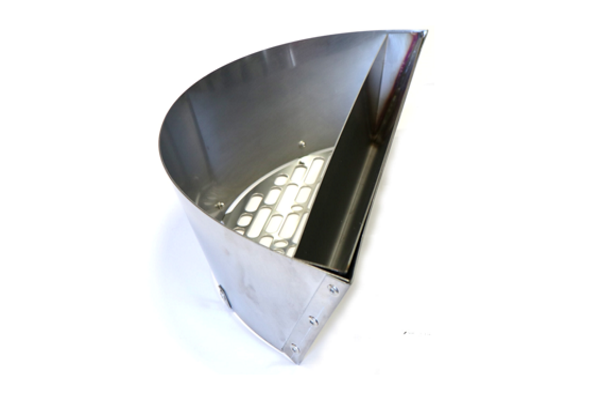 Also available in a Slow ‘N Sear 2.0/Drip Pan Combo Pack and Slow ‘N Sear 2.0 Trifecta! 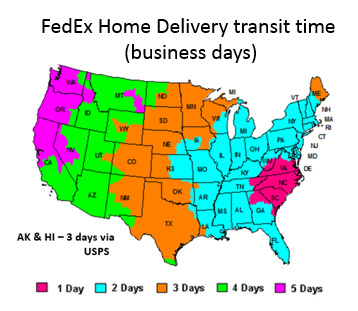 Free shipping to the lower 48 U.S. 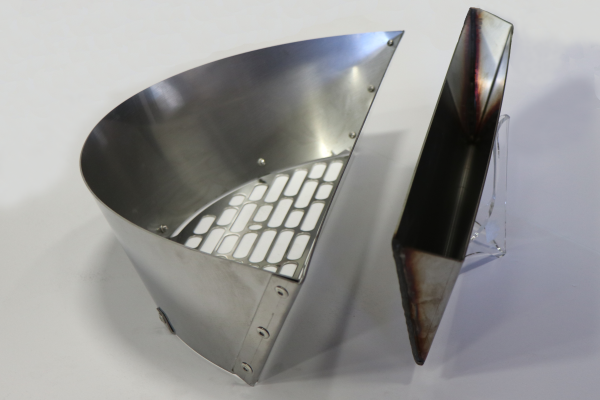 The hand-welded water reservoir can be removed! 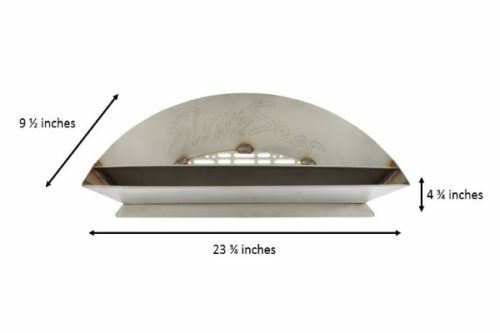 Create a 30% larger sear zone for the perfect Cold Grate Technique sear! 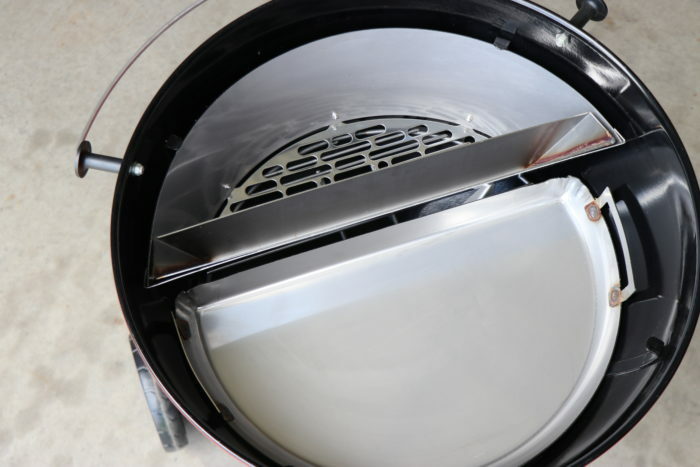 Redesigned ventilation pattern in the base plate to maximize airflow even during the longest cooks. Stainless steel rivet-based manufacturing technique for the basket – simple, strong, and durable. Significantly reduces warping under high-heat conditions. More steel! Each Slow ‘N Sear 2.0 is made out of 7+ pounds of high-quality 16-gauge 430 stainless steel. What makes the Slow ‘N Sear special? The charcoal basket holds a chimney-full of coals and keeps them away from the side of the kettle. 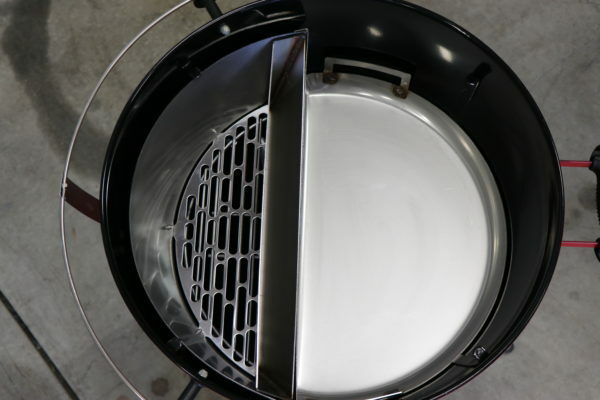 The basket holds more than twice as much fuel as a standard charcoal basket – you can cook for over 8 hours without needing to refill charcoal. 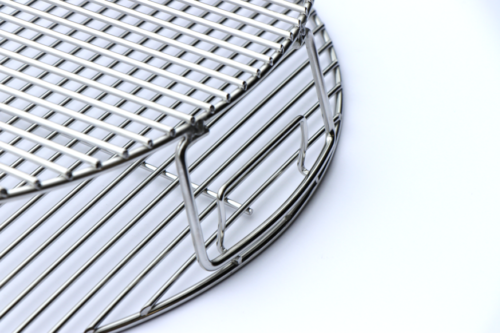 But more importantly the basket helps keep heat inside the kettle so you’re not warming up the air outside the grill. This means more efficient fuel burn and your kettle will be less sensitive to ambient conditions (less babysitting the grill). 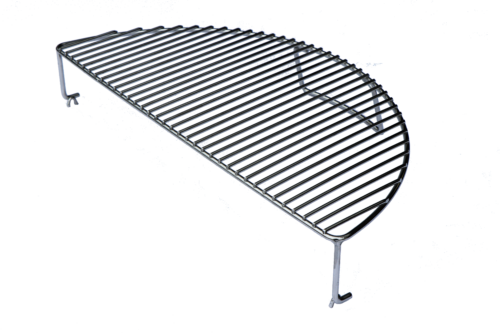 The removable water reservoir spans the length of the charcoal basket acting as a thermal barrier between the coals and the indirect side of the grill. When filled with water (it holds one quart) it generates consistent steam (5+ hours) at low ‘n slow temperatures providing moisture for smoke adherence and a humid environment that keeps temperatures stable across the entire indirect cooking surface. My Slow ‘N Sears are the best accessories I’ve ever gotten for a grill!! Using one now for my first Slow ‘N Sear brisket (14+ lbs after trimming). It held the cook temp solid, and I didn’t add coals until 9 hours in! The Slow ‘N Sear held strong at 235 for just under 5 hours and allowed me to mow grass for 3 hours with no babysitting. It’s almost like cheating for low and slow. I got my Slow ‘N Sear and it made my BBQ so much better. Friends and family always rave about it. Slow ‘n Sear = Easy to use / great support group / plenty of how to videos / great customer service… oh, and the food comes out amazing! Best accessory I have in my collection! The Slow N Sear is the best accessory you can get for the Weber Kettle. 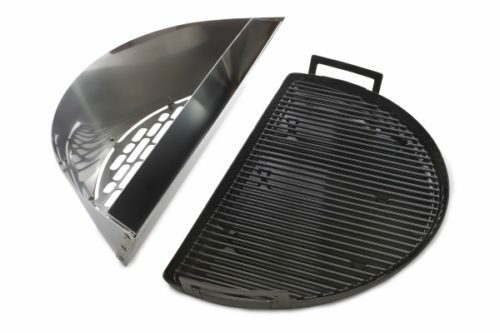 [It] makes it possible for average backyard griller to cook some serious smoked meats! 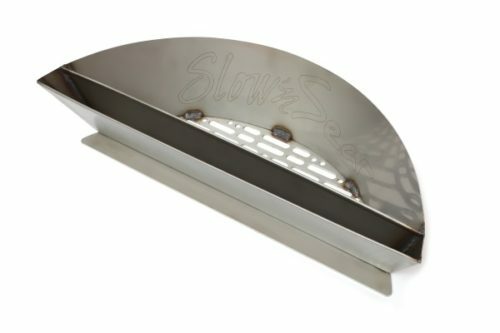 We could not keep pace with the demand for the current version of the Slow ‘N Sear/Slow ‘N Sear Plus. 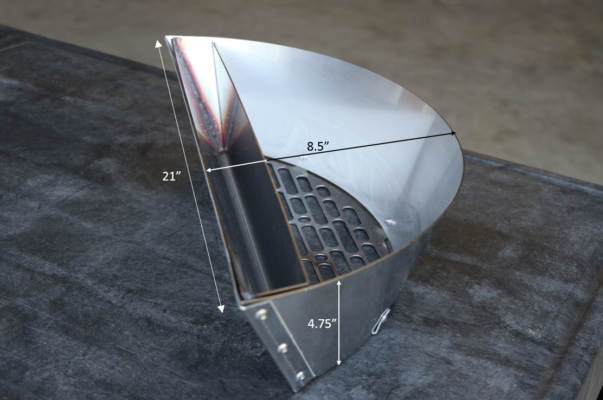 Changes to the manufacturing process allowed us to update the design, maintain the same price, and deliver the same performance and quality of the Slow ‘N Sear Plus. How is the Slow ‘N Sear 2.0 different from the Slow ‘N Sear Plus? Aside from the removable reservoir, functionally, they are similar in performance. Outer dimensions are unchanged. 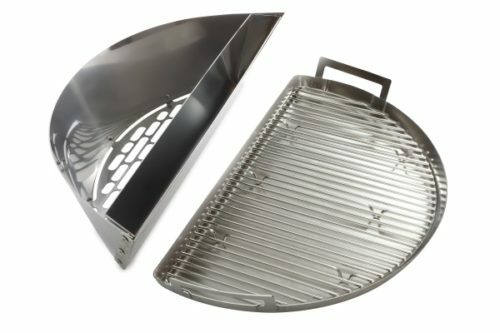 Can I take out the water reservoir during a low ‘n slow cook so I can hold more coals? We don’t recommend it. While it’s the perfect place to hold water, the reservoir also functions as a double-wall barrier between the coals and the indirect side of the grill. 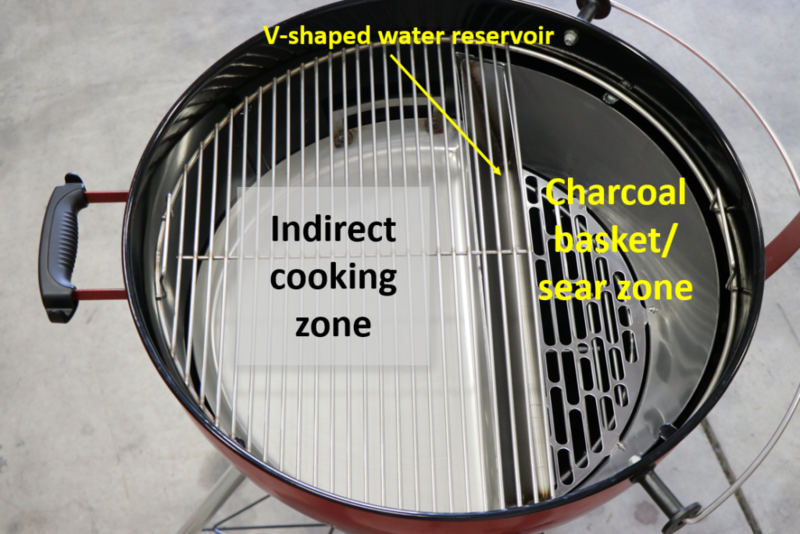 Removing the reservoir during an indirect cook will create “hot spots” on the indirect zone that would not be present with the reservoir in place. 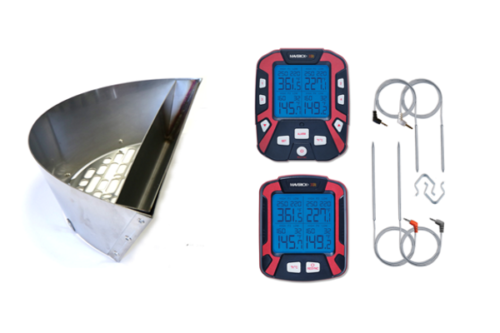 What’s the difference between 430 and 304 stainless steel? Type 430 stainless steel is made up of 17 percent chromium and 0.12 percent carbon while 304 stainless steel contains 18 percent chromium and 0.08 percent carbon. Both are high quality steels that are resistant to rust and corrosion and can withstand the extreme temperatures created by the Slow ‘N Sear and will provide many years of use. Our warranty remains the same. Will you keep making the Slow ‘ N Sear and Slow ‘N Sear Plus? The Slow ‘N Sear 2.0 replaces these two products. Once existing inventory has been depleted, Slow ‘N Sear and Slow ‘N Sear Plus will be discontinued. Warranties on those products will continue to be honored. Will you make a 26″ version? We have no plans to do so as we can meet the demand with the existing Slow ‘N Sear XL. A MUST HAVE FOR EVERY KETTLE OWNER!!! 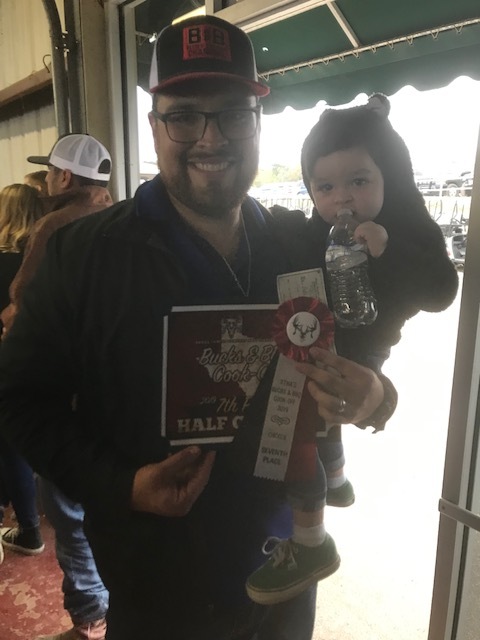 my first competition ever. out of 97 teams I placed 7th in chicken which was cooked on my slow n’ sear. its super easy to use and consistent. do not hesitate! you wont be disappointed. I ordered 2 of these for Christmas. One for myself and one for a friend who is also an avid griller. I’ve only had a chance to use mine twice so far. The first was a tri-tip and the second was a beautiful Prime Rib which I cooked for New Year’s Eve. I followed the ABC instructions on their video along with the rub they recommended. What I can say is this; It was without a doubt the best prime rib I had ever had. My wife and 4 guests would also agree. I would give this product an “Awesome” rating! Husband loved it, works great, arrived in less than 24 hours! Well made. Fast Shipping. Gave it as a gift, so I haven’t used it, but I want one now. Maybe I should get one as a return gift. It came with a charcoal tongs as a purchase bonus, which I thought I would keep for myself. But, it too was well-made and hod “Slow n Sear” branded into the handle, so I included it with the gift. 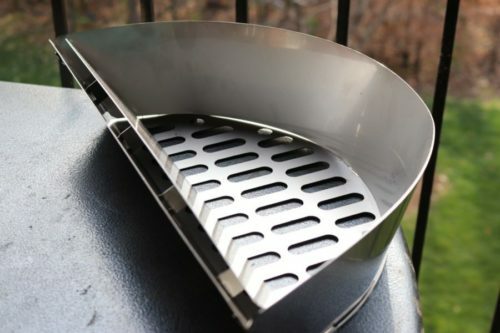 If you grill steaks, you simply must have one of these. Using the sous vide method and a Slow ‘N Sear you can now prepare world class steaks in your back yard. The Slow ‘N Sear is an absolutely essential tool. If you have a Weber charcoal grill, then you must have a Slow ‘N Sear or you are missing out on the possibilities. Product is well made. Like the new removable water trough. I have to agree that this is a must have for the kettle. This is an excellent product! Makes using the kettle a breeze. I own the original plus the 2.0 to use in both of my Weber Kettles plus purchased one for a good friend who just bought his first Kettle. I have done St Louis and Baby Back Ribs on the 2.0 over the last couple of weeks. The results were fabulous! I rubbed a small amount of salt on the ribs the night before and the actual rub just before cooking. Temperature stayed between 225 and 250 for the entire cooking time. I did not have to add charcoal! Highly recommend the Slow “N Sear. It made my Weber into a real BBQ Machine! 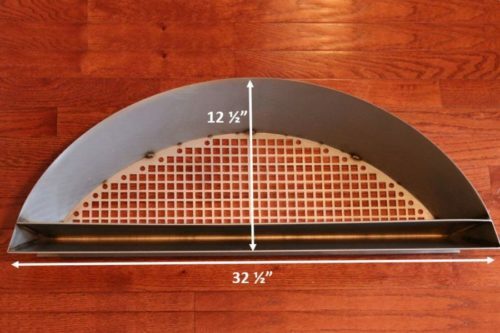 A must for the kettle grill! I bought the SnS 2.0 BEFORE I bought the Weber MT Kettle. The SnS 2.0 does everything they say it does. I love it. A great product from a great company. Thank you Dave, I am thrilled with my SnS 2.0 ! A small SNAFU with my order of the SnS / Drip & Griddle combo pack, but ABC quickly responded and corrected the issue. Mistakes happen – their quick reconciliation shows they care about their customers! As for the SnS, it works great. I was having trouble holding consistent temperatures when I set up the Weber kettle for indirect/smoking via the “water in aluminum pan, indirect charcoal pile” method. First attempt with this product, I followed the directions that come with the SnS basket, and was able to hold temps right at 290-310 for 4-5 hours through minimal vent adjustments. Our kettles will never be “true” smokers, but the SnS is probably the closest we’ll get. Great product for a beginner! Quality, Lighting fast delivery and pleasant . Well built! Fast Shipping! Can’t wait to use. I ordered on a Friday and it was at my door on Saturday. WOW! I have used my Weber 22 since 2005. Indirect cooking mostly and direct for steaks and burgers. 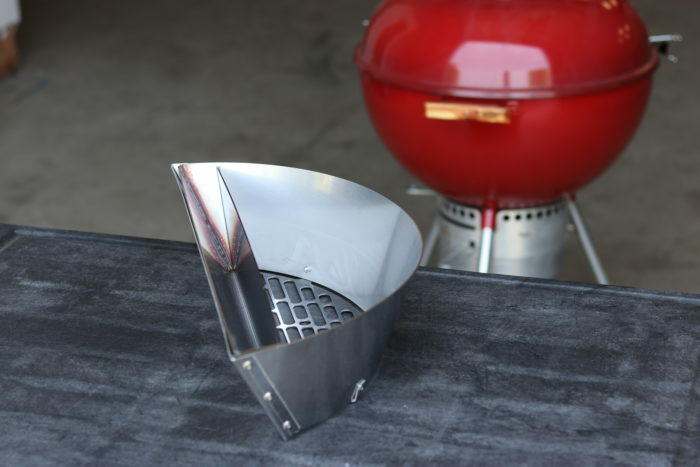 Once I read about the SnS, used a Weber basket on one side with foil to simulate the SnS setup. Until I bought the SnS 2.0 I had no idea how poorly my makeshift setup worked. This has been a real pleasure to use. Steaks and burgers are now indirect and reverse seared with great results. Thick pork chops and chicken are great. Using 8 lit coals and a chimney of unlit to cook a chuck roast was my latest cook and the SnS 2.0 stayed lit and powered though the stall and I did not have to wrap; great bark and my wife really liked it! I am a skeptic by nature – this is worth it! Just buy it and step up your game! Dave’s commitment to this product and service are outstanding as well. Very consistent temps. could easily go 8 hours on coals. Worth every penny! Now my Weber kettle grill Performer is complete. I purchased the SnS to smoke food on the Weber kettle grill. After smoking my first rack of bibs I was hooked. I have never smoked a piece of meat in my life and the SnS make it painless and oh so tasty. I followed the instructions on the abcbarbecue.com web site and they were the best ribs ever. I smoked the ribs for 6 hours and the kettle held a temperature between 220° and 230° once I adjusted the top and bottom vents. After 6 hours at 225° I still had a little under ¼ to of the coals left, I could have easily gone 8 hours. This think is Awesome!!! Was fortunate to get the SnS as a 50th bday present. Since I installed it in June I have made several successful and tasty meals for the family. Great product! This thing is a must if you have a kettle, the water reservoir really helps to create a true 2 zone environment, I get 8 hours of use from 1 batch of coals and it really does an amazing job holding temp. This thing makes the Weber kettle even more versatile than it already is. Could not imagine grilling without it now that I have one! Perfect to step up charcoal barbecue! I’ve been using the Slow ‘N Sear for over a year now and it rarely leaves my grill. It has increased my confidence in backyard charcoal cooking from only doing steaks and burgers and simple chicken, to making excellent ribs, brisket, pork butts/shoulders, chuck roasts, spatchcock chickens, etc.! When the 2.0 version was announced I had to grab it for my second kettle. I like the removable water trough and updated bottom cut-out design – seems to reduce ash build up on long cooks! 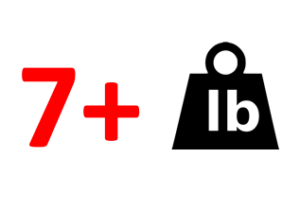 I am very impressed with the build quality of both versions. I often recommend these products to any of my barbecue friends and family. Along with the Slow ‘N Sear, I also have the Drip ‘N Griddle pan and the Easy Spin Grate, they are all used often and I wouldn’t be cooking with the excellent results that I have been without them! I have three two for me one I bought for my mother with the Weber BBQ so I can cook there when I visit. 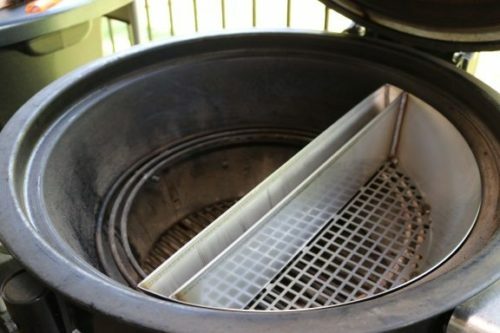 Removable water trough is awesome, don’t think I’ll ever take this accessory out of my grill. I had a previous version of the Slow ‘n Sear, but this model takes it to another level. 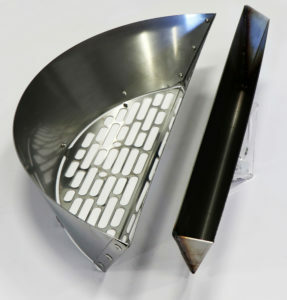 The removable water reservoir makes it more flexible. There’s more room for charcoal when not using water. Another great product from ABC. This thing is awesome! I liked cooking on my Weber till I had this SnS. Now I love cooking on my Weber. This allows you too smoke brisket, ribs, pork, etc with minimal babysitting. Once you have it dialed it you are gold to go. The SnS also makes for cooking wings, burgers, and steaks a breeze. Couldn’t be happier with the product. This has changed the way I use my kettle. I always looking for ways to incorporate this product as part of all my cooks. I can not get enough. My cooks are more consistent and very flavorful. I’m not burning through coals like I’m a stock holder in kingsford. This is worth every penny a solid product. I have always left the outside cooking to the guys. Since I got the Slow n sear. I want to cook everything on it. Everyone praises the taste…even the grands. It is easy and straightforward making this old woman loving it. Thank you David and Catherine. 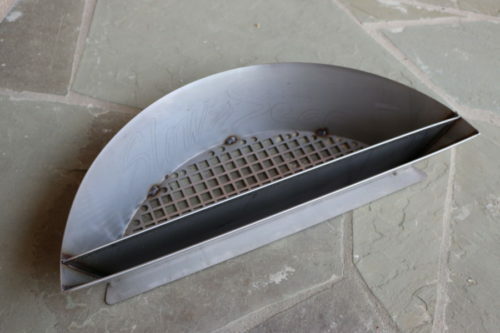 The easy spin grate is on another planet simple but awesome. Great service as usual and the delievery is outstanding as I’m in the UK 4 days! Been looking for smokers and already had a Weber. This made so much sense. So easy. Did 2 racks of ribs last night and came out YUM!!! Now to find space to buy a Weber Ranch edition and tbe Slow n Sear XXXL version!!! Using the Slow ‘n Sear 2.0 gave me unbelievable control over the temperature of the grill. It made for some awesome ribs! As a disappointed new owner of a Weber grill I was most frustrated with the lack of intensity to the heat generated for searing. Once I opened the box I was pleasantly surprised to see a very nicely designed piece of metalwork that was both simple and effective. However until I used it I couldn’t appreciate the terrific way it focuses the heat generated by my charcoal. 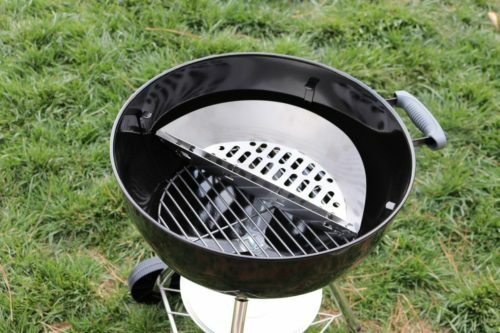 My only complaint is I couldn’t appreciate the benefits of the Two Zone grill with easy spin. Now I can see why it is so valuable.